Mini Race Cars | Project | Kids VT - small people, big ideas! 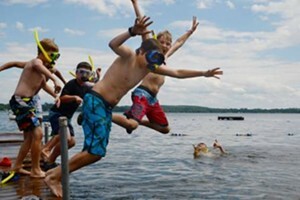 Looking for a fun Father's Day activity? 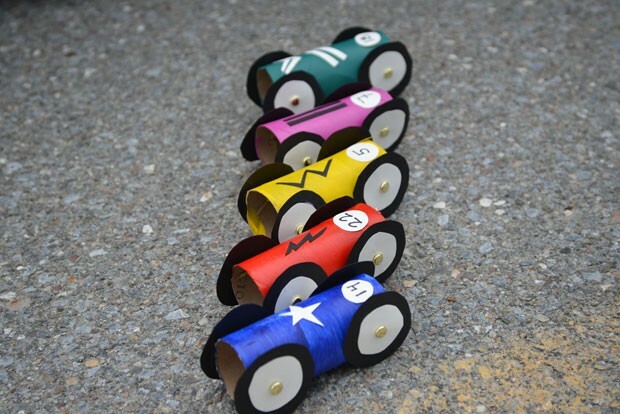 Spend the afternoon with your kids making and racing these colorful cars. Our summer day-cation trip to Thunder Road SpeedBowl inspired this collaborative craft project. Kids paint and decorate the toilet-paper rolls that make up the body of the vehicle; adults can help them pin on the wheels. And you're good to go. Using a paintbrush, paint the empty toilet-paper rolls. Set aside to dry completely. While the paint dries, cut circles out of the black paper for wheels. Cut slightly smaller circles out of the white paper for rims. Glue the white circles onto the center of the black circles and let dry. You want to have four complete sets for each race car. When everything is dry, an adult should attach the wheels to the car using the paper fasteners. If it's difficult to poke the fasteners through the cardboard, try making a hole with a thumbtack first. Decorate the cars as desired, adding racing stripes and numbers. Then start your engines for a road race.